This personalized wedding afghan makes memorable gift for the newlyweds and a wonderful addition to the home. 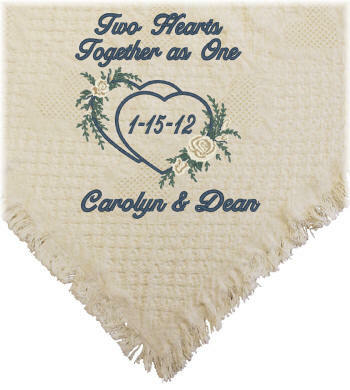 Embroidered in the corner, this wedding afghan features the saying "Two Hearts Together as One" with the wedding date inside the floral hearts and the couple's names embroidered below the floral hearts. This gorgeous wedding afghan makes a wedding gift that will be appreciated for years to come. Gift boxed in a white gift box.